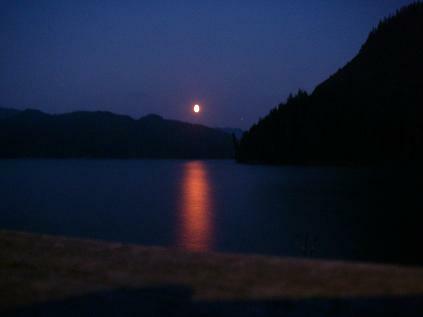 On a rare clear evening a moonrise from the front deck of Grizzly Bear Lodge on Minstrel Island. The marine evening overcast is common but it does burn off by mid morning. Guests and staff always enjoy a clear evening. They were not paying attention because there were two humpback whales of the stern. And one was closer than the one from the front but I missed the tail again. 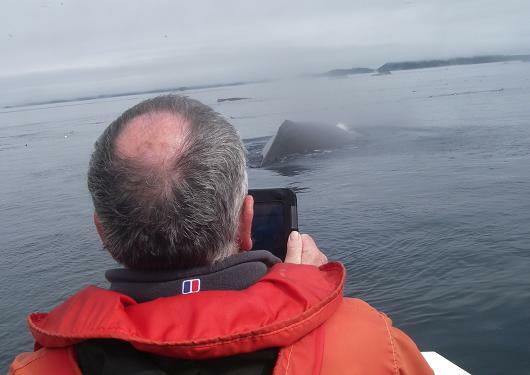 I did get the photo I wanted one that shows a guest getting a close up of the whale activity we frequently experience on your marine wildlife trips. It in not uncommon to see a dozen or more humpbacks on a day trip from Grizzly Bear Lodge and when we stop for lunch and drift in an area where the whales are feeding it can get very interesting.